The greatest B & B Surf - Backpacker independently owned hostel in Montanita. We offer a great breakfast buffet incl. coffee and tea ( all day ) ; local fruits and different kind of freshly baked bread rolls every day from 8:30 am to 10:30 amThe house started off as a beach house. You can bring your own booze to the hostel and enjoy it with a nice sea view from the roof-top. Six from Eight rooms have a balcony and most of them have an ocean view. You can listen to the ocean the whole day and night and relax or sleep with the whisper of the incoming waves. Later on, the owner Jorge decided to rebuild it as a hostel as a consequence of a beautiful love story. Jorge was traveling the world as well, so he understands the needs of his hostel guests. The doors finally opened in 2011. Therefore, over the past years, we have learned how to operate our hostel with each new experience from our guests from all over the world. We could adapt our service perfectly to the needs of our travelers. The hostel is strategically located in a quiet, safe neighborhood, close to the town's main strip (so perfect for a fun night out) and just a few meters from the ocean. Here you can regain your energy after a long travel period or a party night. Esperanto offers you the best ocean view on the most comfortable rooftop terrace in town. We give you all the comforts and services that you as a traveler/backpacker may need, always aligned with our commitments to the environment. All rooms have the same comfort: fans, mosquito nets, and safety boxes are available in every room. In total, there are just eight rooms which give the whole hostel a really familiar vibe: four private rooms and four dorms. The dorms are designed for a maximum of four people with a private bathroom assigned to each dorm. six rooms have a balcony and most of them have an ocean view. You can listen to the ocean the whole day and night and relax or sleep with the whisper of the incoming waves. Really nice hot water in all showers (non-electric). An electricity generator in case of a blackout. Our dorms have a locker and electric outlet INSIDE of every locker so you can leave your electric devices secured (bring your own padlock). There are also communal benefits such as the kitchen, the TV lounge (you even can connect your own Netflix account with ChromeCast) incl. a DVD player (about 400+ movies you can choose from in case you are up for a chilled movie night), a perfect rooftop terrace, internet connection WIFI in all the rooms and the common areas. A green 70 m2 backyard including a painted mini-bar for a get-together, laughing, eating and having some jam sessions. You can bring your own booze to the hostel and enjoy it with a nice view. Therefore, you can’t find it any cheaper in Montanita for a perfect night out. We also offer a great breakfast buffet incl. coffee and tea ( all day); local fruits and different kind of freshly baked bread rolls every day from 8:30 am to 10:30 am. So, you always are full of energy for your new day, prepared for new adventures. PRIVATE SPANISH CLASSES, would you like to improve your Spanish while staying at our hostel right next to the beach? We offer private one-on-one Spanish lessons at Esperanto Hostel and all our instructors are certified Spanish teachers with years of experience. Learn Spanish in the right environment 2 or 3 hours per day, while you still have the rest of the day to chill at the beach sipping on Caipirinhas! And we even offer discounted accommodation if you sign up for a Spanish course with us. Just ASK US about our packages for more information once you have made your reservation. 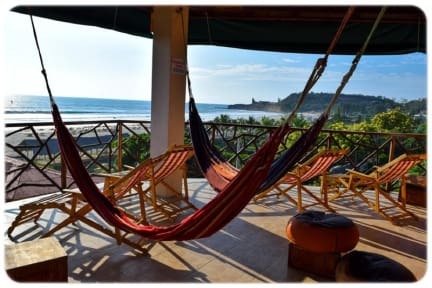 From the hostel, you can get very easily to amazing SURF SPOTS like Montanita beach, Olón beach or La Entrada. You will find waves for all different surf levels and it is the perfect way to get you started on the board as you have enough space in the waves and sandy beaches. In case you need a board or some surf lessons, we can recommend different places to go and great surf teachers. Just ask us at the reception. We are proud to say that our hostel is totally unique. We guarantee that Montanita and its wonders along with our list of amenities and friendly staff will make it hard for you to leave! Age restriction: We only accept guests aged 18 to 50 year. Please note this building has some stairs connecting four floors (which might not be suitable for some travelers). Please consider your own limitations. Although we are not intended to be a party hostel, our guests like to stay out late and interact with each other, as it's quite a social environment. Please keep this in mind (and other facts as we are a backpacker hostel) before making your booking, in order to avoid any disappointment. Please note each room has their own PRIVATE BATHROOM. Some PRIVATE BATHROOMS are NOT ENSUITE in some shared DORMS. My stay at Esperanto was so so nice! I kept extending because of the great location by the beach, the awesome vibes and super friendly staff! They were really helpful and easy to talk to and practice some spanish with. I would 100% recommend it! Absolutely amazing in every aspect! I can't wait to come back to this hostel! I highly recommend! The staff and hostel are the best! This hostel is run really well, we stayed for 8 days and loved it. The location is do close to the beach, and far enough away from the clubs to get some rest. The highlight is the rooftop terrace for sunset, or to do some work, yoga, or just chill in a hammock. There is plenty of fresh fruit and bread for breakfast, which they offered to us the morning we arrived from the night bus. The housekeeper is also very good at her job and makes your bed every day. Everything was great! loved the recommendations from the staff and the breakfast was actually really good! Beautiful hostel, especially the terrace with hammocks where you can watch the sunset and hang out. There was such a nice atmosphere in the hostel. Great WiFi. All rooms really clean. Beds really comfy. The staff were amazing, particularly the manager Roca and the owner was so friendly and helpful too. Montañita would not have been the same experience if I hadn’t stayed in Esperanto. I will definitely go back if I am in Montañita again. Thank you Esperanto!! Great location, friendly staff, clean dorms and bathrooms. Hotwater in the shower. Nice chill out areas. A great place to meet people and hang out when you need a relaxing day or night. Rooftop hammock area had spectacular views of the beach.